Nisim NewHair Biofactors shampoo is effective for both men and women. It's backed with a 100% Money Back Guarantee -- if you do not receive the desired results within 7 days of continuous use*, simply call in for a full refund. There is no time limit to request a refund → click here to view full details. It is more common for women to have normal to dry hair. 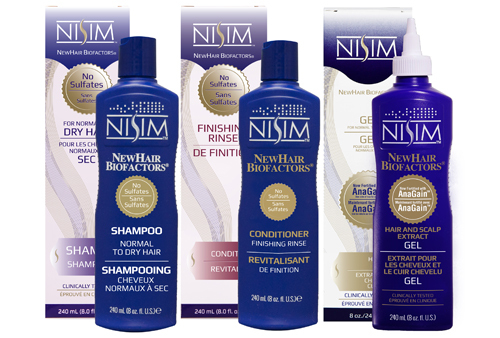 The Nisim Tripack is a complete set of everything you need: Shampoo + Conditioner + Extract. This Tripack is specially formulated for normal to dry hair and scalp and is an economical way to purchase Nisim products. 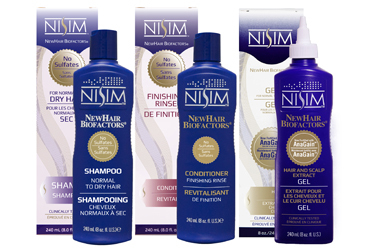 When you purchase this Nisim Hair Loss Tripack you save $17.55! 1 - 8 oz. Normal to Dry Shampoo - The shampoo effectively removes build up of sweat, oils, and dirt the first step in controlling the factors that can contribute to hair loss. 1 - 8 oz. Gel Stimulating Extract. - Once you have achieved the desired results (18-24 months) you can discontinue using the Hair and Scalp Extract and just use the NewHair Biofactors shampoo to maintain your hair. Gel formula is ideal for those with dry hair and scalp. Nisim’s Gel Formula Hair and Scalp Extract now includes AnaGain™. AnaGain™ is based on organic pea sprouts designed to stimulate specific signal molecules in the dermal papilla required to reactivate hair growth. Thanks to its composition, AnaGain™ successfully offers a sustainable and novel approach to fight hair loss. In a clinical study involving AnaGain™ it was shown that the anagen : telogen coefficient (proportion of active hair follicles to degenerating ones) could be improved from 4 to 7.2 corresponding to a 78% increase in hair growth in just 3 months. AnaGain™ is thus a natural and sustainable contributor to fuller and thicker hair. Is this the best shampoo for oily hair? This tripack is formulated for normal to drier hair. You will want to look at this product instead which is meant for oily hair. I’m looking for Sulfate Free Versions of the Shampoo and Conditioner, where can I find those? You can find the Normal to Dry sulfate free shampoo here and the Normal to Oily sulfate free shampoo here. The extract and conditioner does not contain any sulfates. You will need to buy these separately as they do not come in a combo pack. Is this a hair regrowth shampoo? This shampoo is designed to help reduce DHT on your scalp which leads to hair loss. It is a preventative hair loss shampoo. I am looking for hair regrowth products or a hair loss cure. Does this tripack contain any hair products that I can use to help with restoring my hair or help with hair care? The tripack contains our formulated extract which will help you with restoring your hair. You will need to use the shampoo to clean away and maintain your hair and new hair growth. Follow this with the extract to help restore hair growth on your scalp. What is the difference between the Gel Extract and the Original Formula Extract? Both formulations can be used on any scalp type and provide the intended effect and outside of the composition, the gel is formulated to help with more oily hair while the original helps with drier scalps. What causes male pattern baldness? Is there male pattern baldness in women? There are several factors that cause hair loss in both men and women. Male pattern baldness refers to where hair is lost on the scalp. Women tend to lose hair across the entire scalp instead of directly on the crown and forehead. The predominant factor for hair loss in both men and women is DHT or Dihydrotestosterone. This blocks the follicle of the hair from growing. Does this work with other hair treatments? We do not suggest combining products, such as Minoxidil and Nioxin, with ours as there may be unintended consequences or it may lower the effectiveness of any of the products. If you are planning on switching or using one more products from different vendors we strongly suggest that you use the products in rotation as to alleviate chances of an unintended effect. Are you Ovation Hair Products? No that is a separate brand and we are not affiliated. Will this help with dandruff? Both the shampoo and conditioner are formulated to help moisturize the scalp and this will help with dandruff since dry scalp is the leading cause dandruff. Does this contain biotin for hair growth? Yes our products contain biotin to help with hair growth.